Reading and share top 21 famous quotes and sayings about Oddities by famous authors and people. Browse top 21 famous quotes and sayings about Oddities by most favorite authors. 1. "Being the reader of a dark fairy tale is much like being the hero of one. Our lives are filled with pain, boredom, and fear. We want to venture into the dark wood, to see the oddities and the beauties it holds, and to test ourselves against them. So we pick up a book of fairy tales. The real ones. THe weird ones. The dark ones. We see oddities and beauties galore. We test our courage and our understanding. Finally, we put the book down and return to our lives. And hopefully, just like the hero of the fairy tale, we return stronger, richer, and wiser. In difficult times - of recession and violence and political bitterness - we long for a dark forest to which we can escape; and from which we can return, better than we were before." 2. "At first Silas liked the subjects simply because of their strangeness, but slowly he began to believe in the possibilities of what he was reading, in a world filled with secrets and magic. When he was younger, he'd suspected his father believed in many of these things too, so that made it easy for them to talk. As he grew older, Silas began to see the glimmers of hieroglyphic logic behind the occult. There was a reason for these oddities to exist, perhaps as strange connections between the mind and the things people feared or desired. 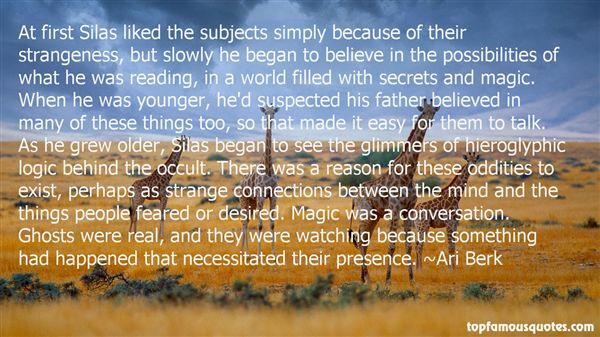 Magic was a conversation. Ghosts were real, and they were watching because something had happened that necessitated their presence." 3. "Finally, after a glance at Notre Dame and a brisk trot through the Louvre, we sat down at a cafe on the Place de l'Opera and watched the people. They were amazing -- never had we seen such costumes, such make-up, such wigs; and, strangest of all, the wearers didn't seem in the least conscious of how funny they looked. Many of them even stared at us and smiled, as though we had been the oddities, and not they. Mr. Holmes no doubt found it amusing to see the pageant of prostitution, poverty and fashion reflected in our callow faces and wide-open eyes." 4. "It may be in the cultural particularities of people — in their oddities — that some of the most instructive revelations of what it is to be generically human are to be found." 5. "That is another of your odd notions," said the Prefect, who had a fashion of calling everything "odd" that was beyond his comprehension, and thus lived amid an absolute legion of "oddities."." 6. "Who wants to become a writer? And why? ... It's the streaming reason for living. To note, to pin down, to build up, to create, to be astonished at nothing, to cherish the oddities, to let nothing go down the drain, to make something, to make a great flower of life, even if it's a cactus." 7. "How could you determine a man's intention if you didn't speak his language or share his beliefs? She'd happily embarked on a study of ancient Egyptian religion but had no curiosity about Islam, which seemed an amalgam of oddities and borrowings. She felt with conviction what she'd written home more than once--that Egypt would be an exquisite country if not for the Egyptians who lived there." 8. "Golosh Street is an interesting locality. All the oddities of trade seemed to have found their way thither and made an eccentric mercantile settlement. There is a bird-shop at one corner. Immediately opposite is an establishment where they sell nothing but ornaments made out of the tinted leaves of autumn, varnished and gummed into various forms. Further down is a second-hand book-stall. There is a small chink between two ordinary-sized houses, in which a little Frenchman makes and sells artificial eyes, specimens of which, ranged on a black velvet cushion, stare at you unwinkingly through the window as you pass, until you shudder and hurry on, thinking how awful the world would be if everyone went about without eyelids. Madame Filomel, the fortune-teller, lives at No. 12 Golosh Street, second storey front, pull the bell on the left-hand side. Next door to Madame is the shop of Herr Hippe, commonly called the Wondersmith. ("The Wondersmith")"
9. "This is the age of oddities let loose." 10. "But Elizabeth was not formed for ill-humour; and though every prospect of her own was destroyed for the evening, it could not dwell long on her spirits; and having told all her griefs to Charlotte Lucas, whom she had not seen for a week, she was soon able to make a voluntary transition to the oddities of her cousin, and to point him out to her particular notice. The first two dances, however, brought a return of distress; they were dances of mortification. Mr. Collins, awkward"
11. "A child who can love the oddities of a fantasy book cannot possibly be xenophobic as an adult. What is a different color, a different culture, a different tongue for a child who has already mastered Elvish, respected Puddleglums, or fallen under the spell of dark-skinned Ged?" 12. "We don't fit in, you and me," he said. "We're both oddities no one knows what to do with. But we fit together." He took her hand, pressed her palm to his, then laced their fingers through each other's. "We fit." 13. "The Indians did not like to see anything odd -- a white squirrel, for instance. . . . They thought such oddities were messages, were omens of evil. . . . And the Indians put a great deal of faith in dreams." 14. "I need to learn to recognize and identify these danger signs when I see them, and not brush them off as "eccentricities," "lovable oddities," or "a sign that he s crying out for help and the comforting of a codependent nurturer that only I, Princess Enabler, can provide. Bad boyfriends don't disguise themselves; their girlfriends do it for them." 15. "The oddities of charming people exasperate us, but there are few if any charming people who are not, at the same time, odd." 16. 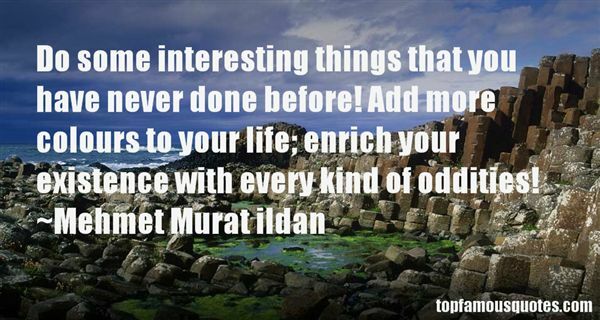 "Do some interesting things that you have never done before! Add more colours to your life; enrich your existence with every kind of oddities!" 17. "So keep fightin' for freedom and justice, beloveds, but don't you forget to have fun doin' it. Lord, let your laughter ring forth. Be outrageous, ridicule the fraidy-cats, rejoice in all the oddities that freedom can produce." 18. "So keep fighting for freedom and justice, beloveds, but don't forget to have fun doin' it. Be outrageous... rejoice in all the oddities that freedom can produce. And when you get through celebrating the sheer joy of a good fight, be sure to tell those who come after how much fun it was!" 19. "The things that stand out are often the oddities." 20. "They were oddities, marginal and not exactly respectable. For her part, Chaps was too well read to be considered entirely proper. Books had made her unreasonably independent." 21. "I seek plain truth I do and I have to I find strange oddities I am now sure I will reveal secrets." The issue, perhaps, boils down to one of how perceptions or misperceptions of racial difference impact various individuals', or groups of individuals', experience of freedom in America. Some would argue that it goes beyond hampering their "pursuit of happiness" to outright obliterating it."